A lost will is a will that is known to have once existed and cannot now be located; and at the same time, it is not known to have been revoked. In short, the will is lost and cannot be found by any of the heirs of the decedent. As a result, the will is presumed to have been revoked by law. Upon being shown evidence rebutting the idea that the will was revoked, the Court can set this presumption aside. This specialized area of estate administration can become very complex. Such cases are litigated in probate court where testimony is taken to prove the existence of the will and/or the revocation of the will. In New York, wills are probated in what is known as the Surrogate Courts. The Surrogate Court requires that the original will is presented to the court for the purposes of probate. If the original will is lost or destroyed, New York is amenable to a copy of the will if two witnesses can testify to the original being in existence at one time. These steps are set out in Section 1407 of New York Surrogate Court Procedure. 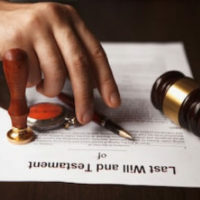 As discussed in summary above, the statute states that a lost or destroyed will may be admitted to probate only if it is well-established that the will was not revoked and the execution of the will is proved in the manner required for the probate of an existing will. Lastly, all provisions of the will must be clearly and distinctly proved by testimony. In the event there is a copy of the will in question, the copy of the will must be proved to be true and complete. New York requires two attesting witnesses for the making of a will. In turn, where a will is allegedly lost, New York requires two witnesses to testify to the fact of it existed. This testimony is in the form of parol evidence where the witness speaks to the circumstances surrounding the existence of the will. The witness must be credible and must have been present during the writing of the will or had first-hand knowledge of its existence. The witness will be highly scrutinized by the court, especially if they are a beneficiary to any property mentioned in the lost will. Other than parol evidence, the witness can bring forth other evidence in the form of documents and drafts. Even if the court concluded that a finalized will was in fact lost, the court must determine whether or not it was properly executed. Just because the finalized will is lost, the rules governing the proper execution of wills still apply. In some cases, the New York court will accept a draft of a will, but only if it meets similar requirements for proving a lost will. It is imperative to involve an attorney when writing a will. To learn more about the estate planning options that best suits your needs, contact an experienced estate planning attorney at Meyer & Spencer, PC. We serve individuals and families in Pleasantville, Westchester, Mahopac and Putnam Counties.